Speaking of media bias. Why are the demonstrators in Nepal referred to on radio and TV as being "pro democracy"? The rebellion is Maoist led and every demonstration is a sea of hammer and sickle flags. 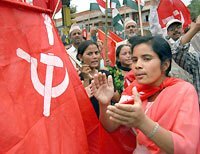 How "democratic" is Maoist revolution? The people who lived through the Chinese Revolution of 1947 or the Cambodian Revolution of 1975 have few kind words for those "democratic" times. Bias at the Herald? No-o-o-o-o-o!